Addressing governance early and as a whole within your organization. In large organizations, governance must be designed at multiple organizational levels, with common governance mechanisms across the organization. 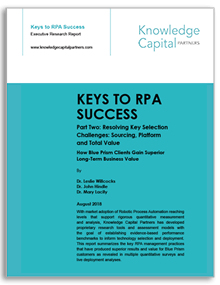 This is especially important, given that RPA will have to fit with legacy IT and future developments in cognitive automation and digital transformation. Next, redesign governance infrequently. Be sure to involve senior managers, and aim for a simple, consistent structure with a small number of performance goals. Clarify the exception-handling process. Assign clear ownership and accountability. Align incentives. Finally communicate everywhere and always, reinforcing how governance works, and what the rules of the game are – governance must be and be seen to be a living framework. This will mean a constant effort to provide transparency and education.